"Greek Coin - 1" by Normadeane Armstrong Ph.D, A.N.P. This is an ancient Greek coin from Pergamon in Mysia made from bronze. 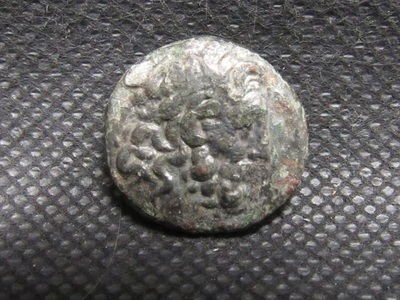 The head of the coin features Asklepios the Greek god of medicine or healing, while the tail features a serpent coiled around the Omphalos which is draped with the agrenon. Omphalos is a sacred stone sited near the prophetic chamber of the oracle of Delphi. The agrenon is a white wool netting which often covered the Omphalos.